Pituitary adenomas are slow-growing, benign tumors that arise from the cells of the pituitary gland. They can be nonfunctional or functional depending on whether they secrete hormones. For non-prolactin-secreting adenomas that are symptomatic through mass effect on local structures or hormonal hypersecretion, or nonfunctional adenomas large enough to warrant elective treatment, surgery is typically recommended. The endoscopic endonasal approach provides safe and thorough exposure of the sella and any tumors within it. 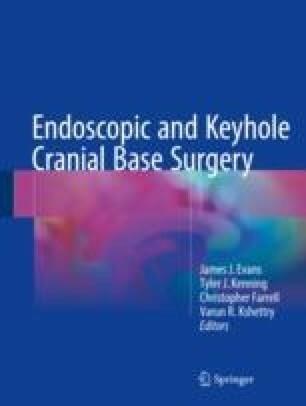 Here, we review the process of evaluating patients with pituitary tumors, including the necessary laboratory and radiographic tests for these patients, and the technical aspects of endoscopic endonasal surgery for pituitary tumors, including preoperative considerations, operative technique and nuances, and postoperative complications. In the hands of an experienced neurosurgeon, the endoscopic endonasal technique is quite successful at resecting these common tumors and helping patients improve or maintain their quality of life. Melmed S, Polonsky KS, Larsen PR, Kronenberg H, ClinicalKey Flex. Williams textbook of endocrinology. Philadelphia: Elsevier; 2016. Available from: http://proxy.lib.wayne.edu/login?url=https://www.clinicalkey.com/dura/browse/bookChapter/3-s2.0-C20130159806. Laws ER, Lanzino G, ClinicalKey Flex. Transsphenoidal surgery. Philadelphia: Saunders; 2010. Available from: http://proxy.lib.wayne.edu/login?url=https://www.clinicalkey.com/dura/browse/bookChapter/3-s2.0-C20090320450.